The Expressionist from Encore Electronics is one of the finest multichannel MIDI to CV converters available. To best harness its power when using a modular synth, we need to bring those back panel jacks out front where we can get to them. While we're at it, how about some LED status indicators? The panel shown here brings out all available signals - 8 gates, 8 control voltages, and DIN sync clock and start signals. It also adds LEDs for the gate and sync outputs. Read on to find out how to build this useful utility module. This panel can be built several ways - passive, unbuffered, or fully buffered. The passive version has no electronics in it whatsoever, and therefore doesn't need a circuit board. Since there are no electronics, the LEDs must be omitted, and holes for them should not be drilled in the panel. 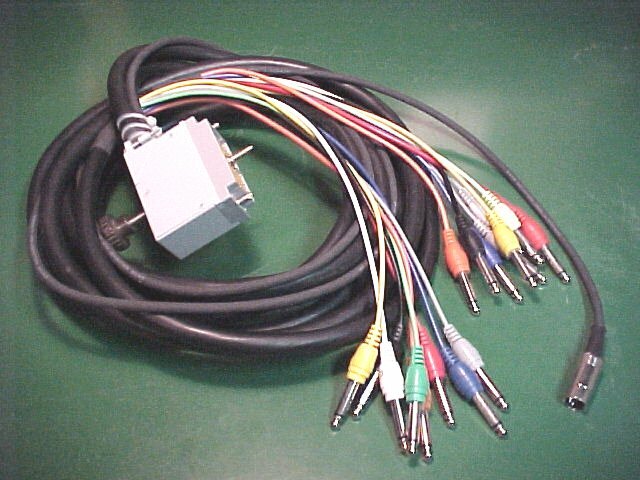 You merely make 16 cables with 1/4" phone plugs on 1 end, and solder the other ends to the appropriate GATE or CV jack. 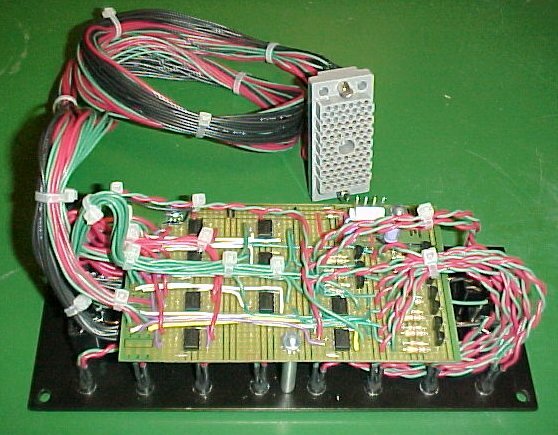 The Expressionist provides the sync clock and start signals on a 5 pin DIN connector (the same connector MIDI uses, but sync functions are completely different.) If you don't wish to use these signals, you could condense the panel down to 1U wide. If you do want to wire them, look at this schematic for the DIN plug pinout. 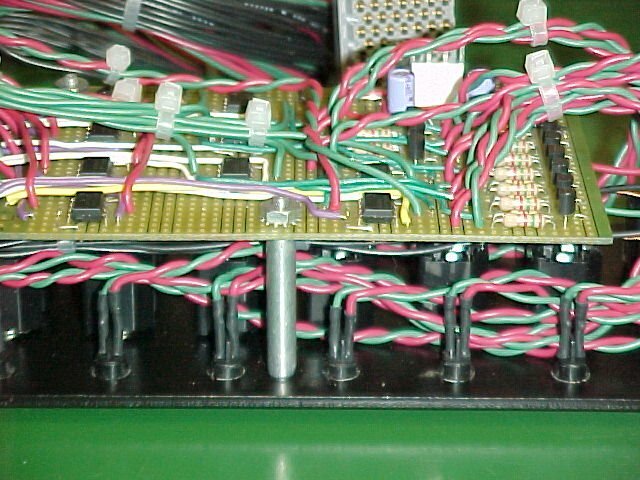 The unbuffered and fully buffered versions require a circuit board. Because of the density of jacks on the panel, there is no good way to mount the board using the typical MOTM L bracket. I took a MOTM diy breadboard, mounted it parallel to the panel, and cut down the width to be slightly narrower than the panel. It mounts with 3 threaded aluminum standoffs, tall enough to clear the jacks. Because my Expressionist is being rack mounted outboard of my synth cabinet, I chose to use some extremely nice ELCO connectors, to create a snake which can be unplugged at both ends. The fully buffered circuit provides opamp voltage followers on all signals. This version provides extra current drive capability for driving many VCOs from a single output, and helps to clean up the signal if the Expressionist box is mounted farther away (as mine is). If you build this version, it's especially important that the opamp buffers for the CV signals provide extremely low drift and offset, so use the LT1013. The gate and sync signals are much less critical - you can substitute other opamps here. Also provided are transister LED drivers designed to supply about 10mA to the Lumex LEDs. The unbuffered circuit provides only the transistor drivers for the LEDs. Be aware that the omitting the opamps on the gates will cause the Expressionist's normal output gate voltage to drop from somewhere around 12V to around 6.5V, due to interaction with the transistor LED driver circuit. This is plenty for MOTM and other synths which only require 5V gates, but it's not enough to trigger some other systems. If you wish to power the LEDs from +5V instead of +15V, change the 1K5 resistor between the LED and the transistor emitter to 390 ohms. Now for the important subject - choosing LED colors! I chose amber for GATE, red for CLOCK, and green for START. It makes for a colorful addition to your modular synth.